I sculpt the hull of the vessel in clay then make a mold from plaster gauze, which I cover with the handmade paper made from abaca pulp. I paint the hull with layers of acrylic washes, sanding between each layer. 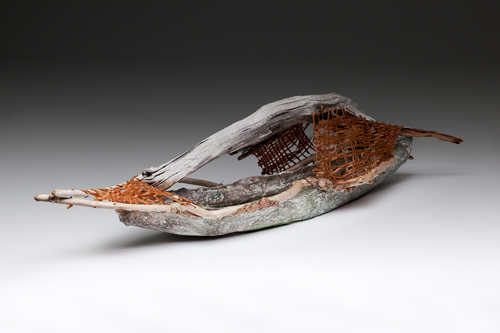 I find interesting driftwood and seed pods, on the shores of Lake Ontario which I use on the vessel. Paper raffia is woven onto the wood on the hull.